The Buick LeSabre is America’s best-selling full-size car in and has been for the past 10 years. For 2003, Buick is celebrating this market dominance with a special edition of the LeSabre called (what else?) the Celebration Edition. Distinguished by body-colored trim and a two-tone leather interior, the Celebration Edition comes loaded with luxury and safety features. But for car buyers with traditional tastes, any LeSabre is cause for celebration. LeSabre offers a big, roomy interior, a comfortable ride, a big trunk, and it’s packed with safety features. In short, the LeSabre brings all the traditional Buick virtues into a new era of fuel-conscious practicality. XM Satellite Radio is now available for Limited and Celebration Edition LeSabres. New 16-inch aluminum wheels are available with the Gran Touring package and all LeSabres are available in new metallic colors. Other changes for 2003 are minimal. The Buick LeSabre lineup consists of the Custom ($25,020) and the Limited ($30,650). LeSabre Custom comes with front and side airbags, air conditioning, four-wheel anti-lock disc brakes (ABS), cruise control, power door locks, power windows, power mirrors, remote keyless entry, AM/FM/cassette four-speaker stereo, eight-way power driver’s seat, adjustable steering column, automatic level control, a theft deterrent system, a power trunk release, and 15-inch steel wheels. The Limited model adds automatic dual-zone air conditioning, a driver information center, OnStar global positioning, an upgraded Concert Sound II stereo with cassette and CD, 10-way power seats with heat and leather upholstery, 16-inch aluminum wheels, and traction control. Traction control comes standard on the Limited, and Stabilitrak ($495) is optional. For sharper handling, add the Gran Touring Package ($285), with a rear stabilizer bar and 16-inch aluminum wheels with 225/60R16 tires. Want some of the Limited’s features without springing for the Limited? Most of its features are available a la carte for the Custom model by ordering various packages or standalone options. The Celebration Edition ($1135) is a package for the Limited model that comes with OnStar, GM’s StabiliTrak stability control system and a heads-up display plus all the goodies on the Limited model. Distinguished by body-color lower fascias and rocker panels, a blacked-out grille, a monochrome emblem, and chromed 16-inch wheels, the Celebration Edition is available in three exterior colors: Crimson Pearl, White Diamond, and Light Bronzemist. Inside, the Celebration Edition features two-tone leather seats with embroidered logos, embroidered floor mats, and Black Cherry wood grain on the instrument panel and doors. It also comes with turn-signal indicators in the side mirrors, which help better signal your intentions to drivers alongside or in your blind spot. XM Satellite Radio ($325) is an option for Limited models, with 100 coast-to-coast digital channels, including music, sports, talk, news, and children’s entertainment. 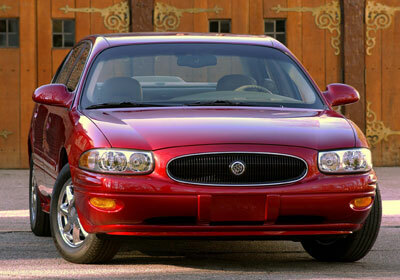 From some angles the Buick LeSabre shows styling cues that would not look out of place on a Jaguar. Yet it retains a strong Buick identity, with nicely rounded edges and plenty of attractive curves. In profile, particularly, it features a nice curvy upturn along the rear doors, leading to a high trunk. It’s a nice classic touch, fitting LeSabre’s position as a premium sedan. Up front rides a distinctive Buick grille that sits well forward, where it’s almost part of the bumper (a look Buick pioneered in the 1940s). The headlights are well integrated into the sweep of the fenders. Safety is important to LeSabre’s image. Dual front airbags are a given, but LeSabre has side-impact airbags for the front seats, too. Anti-lock brakes are standard. The front seat belts are mounted to the seat frame, so they move with the seat for greater comfort. The seats boast a relatively new design that the engineers like to call a “catcher’s mitt.” The seat back is much stiffer than usual; in an accident it holds the occupant in place while the headrest moves forward to lessen whiplash. According to Buick, it is especially effective in common low-speed, rear-end collisions. The Buick LeSabre is a comfortable car, roomy, and easy to operate. The leather seats are comfortable, if plain in appearance. Nice trim materials are used throughout. Advanced safety features have helped the LeSabre earn it a double five-star rating in U.S. government crash tests. The electronic climate control is easy to operate. Heated seat controls are clearly marked and located right on the doors where we could find them. Likewise, the radio is well-designed with big volume and tuning knobs. We found it easy to seek and set radio stations and we liked the in-dash CD player. Too many cars come with radios with tiny knobs that are hard to adjust while driving. The LeSabre isn’t one of them. Big round analog gauges are easy to read. The speedometer is clearly marked and can be read at a glance. Fuel and temperature gauges are big and easy to read. The driver information center on the Limited and Celebration Edition features a digital readout that can display oil temperature, fuel consumption, tire pressure and other data. The dashboard looks fresh and modern, undulating across the width of the car in gentle, organic curves. A canopy over the instruments extends from the passenger side to the driver’s door panel. This design gives the interior an open feeling and nicely integrates the door trim into the dashboard. A wide strip of faux wood trim extends along the door panels and across the center of the dash. The pull-out storage tray feels flimsy, however. A front bench seat is standard on the LeSabre, split 45/55 so the driver’s side can be adjusted separately from the passenger’s. A bench seat does not usually provide as much support as a bucket seat, and the LeSabre’s is no exception. Cover it in leather and you may find yourself sliding around on winding roads. Also available are separate seats and a center console. The console features two large cup holders that spring out at the touch of a button. A large flat writing surface also flips out. It could prove useful for keeping a notepad handy while on the road, but it sits at an awkward angle, and we found it difficult to use. Wide doors allow easy access to the front and rear seats. Rear-seat passengers will find plenty of room. The current LeSabre is wider than pre-2000 models, but it still gets a bit tight with three adults in back. The rear-center armrest opens into the trunk to provide space for skis and other long objects. The 2003 Buick LeSabre feels smooth on smooth roads. The old floating sensation of Buicks past is gone. When you stab the brakes, the nose doesn’t dive for the pavement. Standard self-leveling rear suspension keeps the ride consistent regardless of the number of passengers aboard. The brakes feel and work excellent. The brake pedal feels smooth and it is easy to modulate the brakes (better in that respect than the new Mercedes E-Class). Jam on the brakes and the LeSabre comes to a quick stop, without drama, that’s easy to control. Anti-lock brakes come standard, allowing the driver to maintain control of steering in a panic stop. The steering feels light and precise, making this a nice, pleasant car around town. It also handles smooth gravel roads well. We were disappointed by the amount of vibration on rough roads, however, especially at low speeds. When driven quickly on a rough, undulating road, the suspension loses composure and bottoms out on sharp dips. The available Gran Touring suspension improves handling a bit through the addition of a rear anti-roll bar that should help reduce understeer and body lean. The LeSabre’s 3.8-liter overhead-valve V6 is one of GM’s best engines. It delivers good acceleration performance, even against the LeSabre’s substantial weight. Likewise, the electronically controlled four-speed automatic transmission shifts smoothly between gears. Lots of sound insulation makes for a quiet cabin. Although not officially billed as a luxury car, the LeSabre provides a more luxurious environment than most luxury cars of just a few years ago. Limited buyers can choose a $730 Driver Confidence Package. In addition to self-sealing tires and a head-up instrument display, this package includes StabiliTrak, the electronic vehicle-stability system. The head-up display projects speed and other information onto the windshield in front of the driver’s eyes and it comes in handy. More important is StabiliTrak, and we highly recommend getting it. Stabilitrak helps the driver maintain his or her intended line through a corner in slippery conditions by gently applying the brakes on one or more wheels. It cannot overcome the laws of physics, but Stabilitrak adds a margin of safety by partially correcting driver errors. Buick prides itself as a maker of premium American cars. For not much more than the price of a mid-size car, the LeSabre delivers room for five or six and many luxury conveniences. Its ride is as comfortable as you’d expect and the friendly interior make being in the Buick LeSabre a pleasant experience. Head/hip/leg room, f: 38.8/56.1/42.4 in. Head/hip/leg room, r: 37.8/56.6/39.9 in. Cargo volume: 18.0 cu. ft.